This dainty heart ring in sterling silver looks darling on its own or stacked with any of our other great stacking rings. I can hand stamp a date or name on the back of the band for you, up 8 characters in lowercase typewriter font. Available in whole sizes 4-10, choose your size from the dropdown menu. 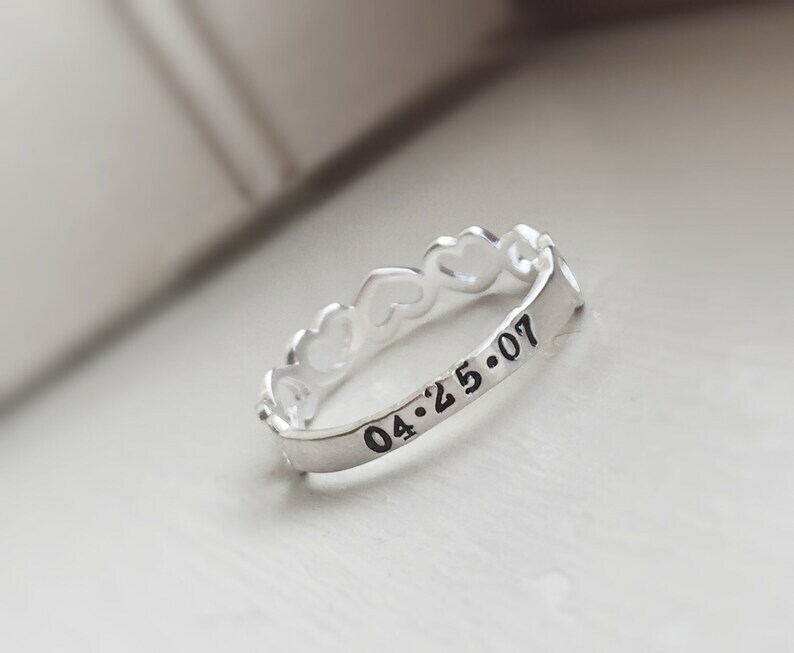 This listing is for one heart stacking ring in sterling silver. If you'd like to order more than one, choose your quantity from the dropdown menu as well. Once you've added the item to your cart, on the checkout screen, you'll see a box where you can type in what you'd like stamped on the back of the band, up to 8 characters only in lowercase typewriter font. Your new ring will arrive in River Valley Design's signature cotton pom gift bag, perfect for gift giving! All ring purchases are final, so be sure to choose the correct size when ordering. Got the ring on time. Very nice.